Her intimate, connective writing style comes from experiences and aspirations from her own life. When you listen to her music, you are introduced to a private piece of who Albright is, has been, or is becoming.Selina Albright’s R&B/Soul 2013 release entitled “Brighter” topped the UK Soul Chart for four weeks, and her sassy 2010 Jazz original “You and I,” was featured on iTunes’ “Top 100 Downloads” list for the genre of Jazz in 2010! 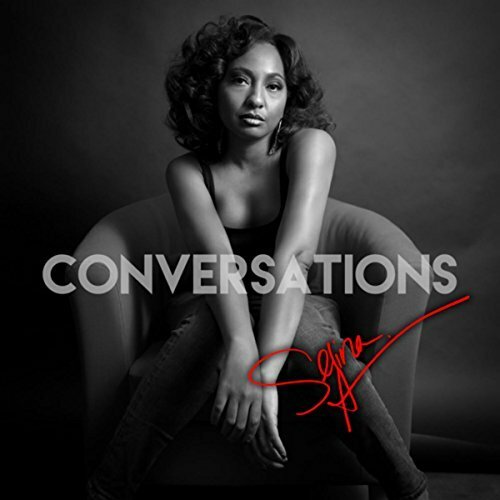 Her most recent release “Sun Comes Up” (2016) has outperformed all previous releases, and her first full-length project, an R&B/Soul CD entitled “Conversations,” will release on March 17, 2017! FRISCO (30 January 2017): While a song about the joy of packing on a few pounds and a widening booty may seem contrary to the messages bombarding the popular music and media landscape, smooth soul singer Selina Albright’s “Eat Something” is instantly resonating with fans and radio programmers, including SiriusXM Watercolors’ Dave Koz Lounge, which will feature the song on the February 5 national broadcast. The mid-tempo adult R&B song bolstered by guitarist Kay-Ta Matsuno’s crafty touch is the lead single from Albright’s first full-length album, the very personal “Conversations,” which will be released March 17 by Golden Rays Music with preorders beginning February 1 on iTunes. Describing the custom-tailored blend of sensual soul and sultry jazz album as “my own therapeutic diary through joy, betrayal, liberation and hope, all written without holding back,” Albright wrote the lyrics for all nine original tunes and co-produced three tracks on “Conversations.” Her subject matters are based upon intimate and probing conversations she’s had, shared as if she’s confiding in a close friend. Whether skillfully unleashing the full power and magnitude of her gravity-defying voice or harnessing her passion in a reassuring caress, Albright’s demeanor remains sunny and glowing on uplifting numbers like “Possible” and “Highest High.” Even when confronting weightier subjects head on like she does on “Wifey Anthem (You Don’t Have To Fight At Home)” and “Victim,” her inherent optimism remains present and undaunted. “Let Go” also is wrought with emotion and includes dramatic flute flourishes from multiple Grammy nominee Gerald Albright, Selina’s father. The disc’s lone cover is a stripped down, jazzy rendition of “If I Were A Boy” with accompaniment by contemporary jazz hit-maker Peter White on acoustic guitar and Randy Ellis (Stevie Wonder, Beyoncé) on sax. Also contributing to the date are producers Chris “Big Dog” Davis and James “JRob” Roberson as well as guitarist David P. Stevens. Born and raised in Los Angeles, California, Albright was reared in the jazz and R&B scene, making her first appearance singing on one of her father’s albums twenty years ago. She has since sung on several of his collections, including penning lyrics and singing on the Grammy-nominated “24/7,” a 2012 duet set from the chart-topping saxophonist and Grammy-winning guitarist Norman Brown. Oozing stage presence, exuberance and captivating charisma, Albright has made her own name while singing on records and on stages around the world, shining brightly amidst a galaxy of contemporary jazz stars and R&B legends that spans Brian Culbertson, David Benoit, Dave Koz, Kirk Whalum, David Sanborn, Boney James, Richard Elliot and Rick Braun to Chaka Khan, Will Downing, Regina Belle, The Temptations, Hugh Masakela and the late George Duke. In an entirely different setting, she injected her soul-powered energy into the electronic dance music world by collaborating with Manufactured Superstars, leading to a performance with the internationally-revered DJ duo at Las Vegas’ Electric Daisy Carnival in 2011. Recording as a solo artist, Albright placed the spirited jazz original “You and I” on the iTunes Top 100 Singles Downloads in 2010. A few years later, she topped the soul chart in the United Kingdom for four weeks with her R&B/soul single “Brighter.” Last year, Albright primed the marketplace for “Conversations” by issuing “Sun Comes Up,” which outpaced her previous singles. Find it on iTunes and Amazon. For a signed physical CD, visit the Online Store.